We are on the Black Isle - north of Inverness. You can see us on our Google map or on the map below. 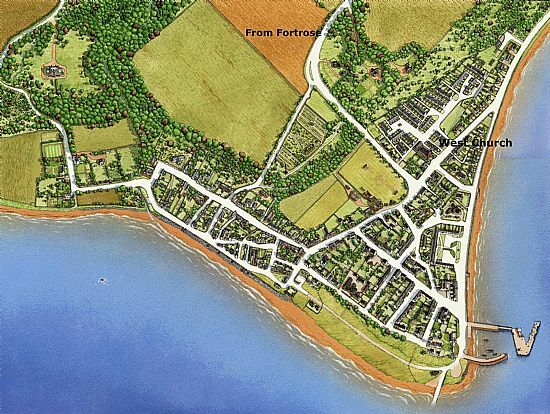 Coming by car from Fortrose, you come down the hill into Cromarty and swing left at the foot of the hill. The West Church is about 100 meters along on the left hand side. If you are coming along the coast via Jemimaville, then just after you get to the first houses in Cromarty, you take a right fork and drive for about 150 meters till you see the church on your right. See the map below. If you want to use your satnav, the postcode is IV11 8YR. There is a bus service - number 26 - from Inverness, passing through the villages of the Black Isle. To get to the hall, you go in the church gates and walk up the left hand side of the building till you get to the second door. The building is disability-friendly. Disabled/wheelchair access is provided through the same door on the paved path running down the East side of the church. There is a fully equipped disabled toilet off the east lobby of the hall. We also have a 'loop' system for hearing aid users.